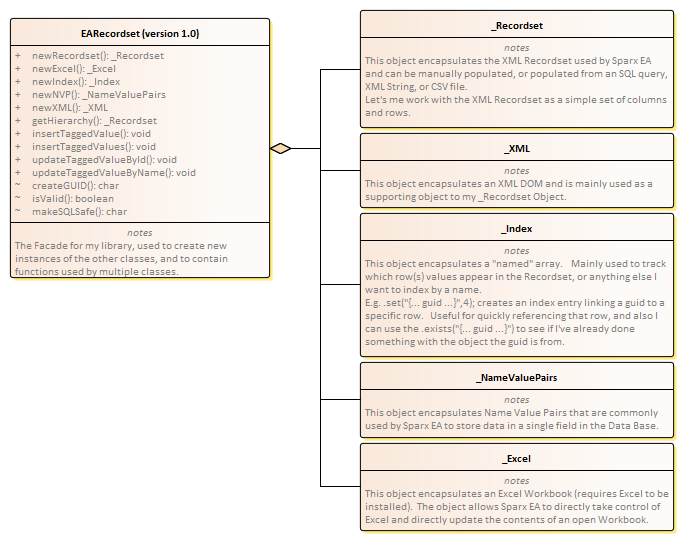 EARecordset is a script library I’ve created to simplify working with the XML structures Sparx EA uses to encapsulate the results from SQL queries. newRecordset(inSQLString) inSQLString (optional): provide an SQL select statement that will be used to query your Sparx EA repository. The _Recordset Object will be populated with the returned column(s), row(s) and value(s). Returns: a new instance of a _Recordset Object. newIndex(bCaseSensitive) bCaseSensitive (optional): set before you start using the index to indicate if the index keys are case sensitive or not. E.g. is “Steve” the same as “steve”. Returns: a new instance of an _Index Object. newNVP(inListString, inDeliminator) inListString (optional): set the initial list of name value pairs that you want to work with. getHierarchy(inTypeID, inID, bUP,inReturnTypeIDs) inTypeID: the numeric object type ID for the object type you want to get the parent/child hierarchy for. inID: the numeric ID or GUID for the starting object, or an Array of these. bUP (optional): the direction to traverse the hierarchy. inReturnTypeID: the numeric object type ID for the parent/child objects you’d like to return, or an Array of these. EAGUID: the GUID of each object in the hierarchy. EATypeID: the numeric Object Type ID of each object in the hierarchy. Name: the name of each object in the hierarchy. Stereotype: the stereotype of each object in the hierarchy. Path_ID: a comma separated list of the hierarchy of Parent or Child ID’s leading up, or from to the starting object’s ID. Path_GUID: same as Path_ID, but with GUIDs. insertTaggedValue(inTypeID, inParentID, inName, inValue, inNote) inTypeID: the numeric object type ID for the parent object for the tagged value. inParentID: the ID or GUID of the parent object for the tagged value. insertTaggedValues(inTypeID, inRecordset) inTypeID: the numeric object type ID for the parent object for the tagged values. ParentID: the ID or GUID of the parent object for the tagged value. This function does a direct write to the Database containing your Sparx EA. It uses an undocumented API function Repository.Execute to write multiple inserts with a single commit… drastically improves performance. Currently limited to tagged values due to their simple nature. inTypeID: the numeric object type ID for the parent object for the tagged values. updateTaggedValueByName(inTypeID, inName, inValue, inNote) inTypeID: the numeric object type ID for the parent object for the tagged values.